Are you responsible for ensuring that your SME conforms to the requirements of GDPR? You know what needs to be done but how, who and when are challenging open issues. During this workshop you will develop a detailed implementation plan and schedule of how and when the work will be done and by whom. The Bootcamp format leverages from Best Practice Project Management according to the international standard ISO 21500:2012 applied to the specific case of GDPR conformity. You benefit from the experience of the course consultant and the interaction with other participants who have similar objectives. Important: This is an implementation workshop, not advice on GDPR itself. If you know what to do, this workshop will help you get it done. First and last names of all other participants, one per line. A 1hr follow up consultation within one month of the event. Your manager, colleague, subordinate etc. can also participate. Send us your details by clicking on the "I confirm Bootcamp enrolment" button below. Deadline: 12.00 midday on the Friday before the workshop. On receipt of payment by Scatterwork GmbH, you will be issued with a confirmation email with invoice/ receipt and joining details for the Bootcamp, which will be held at a location in Ballsbridge. 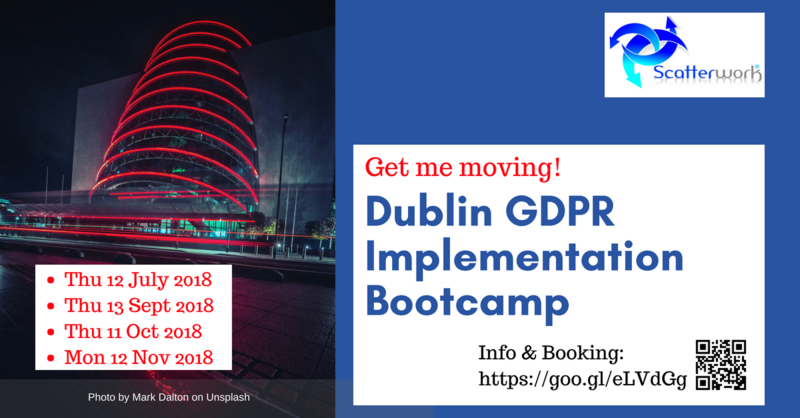 I confirm the definite registration(s) for Dublin GDPR Implementation Bootcamp on 12 Nov 2018 based on the information provided in the form above. Notified but not anonymous replacements can be made up to the close of business on the day before the start of the event. Logistics information will be sent on receipt of the payment. ...are aware of the importance of GDPR, have a basic familiarity of GDPR and what needs to be implemented and have the authority to act within their company.